Source: U.S. Energy Information Administration, Annual Electric Generator Report (Form EIA-860). Combined heat and power (CHP), also called cogeneration, is an efficient approach to generating electric power and useful thermal energy for heating or cooling from a single fuel source. Instead of purchasing electricity from the grid and producing heat in an on-site furnace or boiler, a CHP generator provides both energy services in one energy-efficient step. 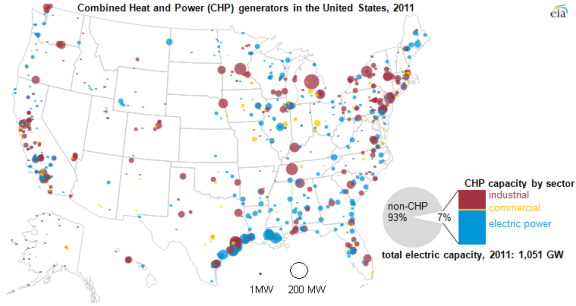 At the end of 2011, there were nearly 70 gigawatts (GW) of combined heat and power (CHP) generating capacity spread across the United States, accounting for almost 7% of total U.S. capacity, with 25 GW in the industrial sector, 2 GW in the commercial sector, and 43 GW in the electric power sector. In 2011, the average capacity factor for generators at industrial CHP plants was 57%, the equivalent of running at full capacity 57% of the time. CHP facilities tend to be built in conjunction with certain industries that have heat or steam demands. For example, the map above shows a concentration of CHP units along the Gulf Coast, where many cogeneration plants are located near refineries and chemical plants. A number of smaller installations are located near pulp and paper mills in the South, in northern Wisconsin, and in Maine, burning the wood waste byproducts as fuel. CHP installations are also common in states with a history of utility regulation that is favorable toward CHP, such as California and New York. CHP technology takes advantage of the waste heat from electricity production to provide both electricity and useful thermal energy from a single energy source. CHP can be more efficient and cost-effective than providing heat and electricity separately, which would typically require more fuel use. CHP capacity additions followed the pattern of the electric power industry (for more information, see previous articles on capacity, primarily natural gas), peaking in the early 2000s, building an average of more than 2,960 megawatts (MW) per year for the 2000-2005 period. CHP capacity additions slowed in the 2006-2011 period (as did most non-CHP capacity additions), averaging less than 500 MW of new CHP capacity per year. In 2012 (through the end of August), six CHP generators have come online, totaling 209 MW. New generators proposed for 2013-2016 include more than 3,700 MW of CHP. In general, CHP growth can be slowed by institutional barriers, such as an unfavorable regulatory environment, or by risk factors in cost-benefit analysis, such as the additional capital expense of a CHP unit. CHP plants can be found in three sectors: the electric power sector (plants whose primary purpose is to produce electricity for public sale); and the industrial and commercial sectors (where the CHP facility is usually intended to provide electricity and steam to the host facility, such as a factory). More than 85% of all generating capacity sited at industrial and commercial facilities uses CHP technology. Industrial applications with constant thermal and electricity demands are ideal candidates for CHP. In the industrial sector, CHP is most likely to be found in energy-intensive manufacturing, especially those that generate combustible byproducts. The majority of industrial CHP capacity can be found in the chemicals, petroleum refining, and paper industries. The food and primary metals industries contain much of the remaining CHP. In the commercial sector, CHP is often used for building or campus heating and air conditioning, such as at college campuses and hospitals. In the electric power sector, only 4% of the electric generating capacity is CHP. These plants in the electric power sector typically have an arrangement with a neighboring facility, often industrial, to purchase the waste heat. The three largest examples of such facilities (consuming the most fuel to produce heat) all reside in Texas: the Deer Park Energy Center, which supplies steam to a neighboring Shell Chemical Company manufacturing plant; Channelview Cogeneration, which supplies steam to Equistar Chemical; and Sweeny Cogen, which supplies steam for a ConocoPhillips' refinery. EIA collects capacity and related data on all generators at plants with more than one MW of capacity on the Annual Electric Generators Report, and recently posted final data for the year 2011. Useful thermal output (UTO) accounts for most CHP fuel consumption, rather than electricity production. In the industrial sector, 70% of fuel consumption (primary energy input) at CHPs was used to produce UTO (on an energy basis, averaged over the 2004-2011 period), and in the commercial sector, 65%. In the electric power sector, only 28% of CHP fuel consumption is used for UTO production. Between 2004 and 2011, 6.5% of total fuel consumption reported to EIA was used to produce UTO. CHP systems operate with a wide range of fuels. Natural gas, however, is the most common primary energy source used in combined heat and power stations, followed by coal and biomass (often in the form of waste products at paper mills). Over 65% of CHP capacity currently operating in the United States is using natural gas as a primary fuel source, and therefore benefits from the low prices resulting from increased shale gas production. However, CHP generators are far more likely than other generators to burn a wide variety of fuels (e.g., different types of biomass and industrial byproducts). CHP facilities, particularly those at industrial sites, were disproportionately hard hit by the recent economic recession. While electricity generation at non-CHP plants increased 4.8% between 2004 and 2011, electricity generation at CHP plants decreased by 11.2% over this same period. EIA collects consumption and generation data on all generators at plants greater than one megawatt on the Annual Power Plant Operations Report, which also recently posted final data for the year 2011. The technology choice for a CHP facility depends on available fuel and the amount of generating capacity needed. Reciprocating internal combustion engines are widely used in small-to-medium applications (under 10 MW). Larger systems use industrial boilers, simple-cycle steam turbines, and gas turbines, as well as combined-cycle systems that are similar in design to combined-cycle units used in power production. UTO produced by CHP plants is typically in the form of steam and is used in a variety of ways. Some industrial processes use heat, hot water, or steam directly. Other installations use UTO to create chilled air or water using an absorption chiller, or dehumidify air using a desiccant dehumidifier. A typical use in a commercial installation is space heating. While the technologies and statistics discussed above often refer to large utility-scale projects, a sizable portion of current CHP research is devoted to small-scale CHP, particularly microtubines—compact, lightweight units of 25-500 kilowatts in capacity that could be used in homes and other buildings. Twenty-three states recognize CHP in one form or another as part of their Renewable Portfolio Standards or Energy Efficiency Resource Standards. A number of states, including California, New York, Massachusetts, New Jersey, and North Carolina, have initiated specific incentive programs for CHP.